FeedBack ( 0) This impressive custom home and adjacent vacant lot are perched on high for glorious panoramic mountain and valley views. The interior boasts three spacious bedrooms, three and a half baths, a den, high end finishes and top of the line appliances, i.e. Thermador gas top stove, Miele dishwasher, GE Monogram full refrigerator and full freezer, etc.! Other extras include a 10-station hydronic in-floor heating system, gas fireplace in the living and master bedroom, gorgeous grand staircase, 3 car detached garage with a 1,080 sq. ft. pre-plumbed and wired potential guest accommodations below garage, composite decking, cement board siding, knotty alder cabinets and distressed hickory hardwood flooring. 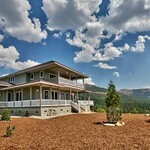 Fawn Lane offers privacy, is just minutes from Lake Davis but is still less than an hour from Reno for your necessities. Prepare yourself for the jaw-dropping views from this spectacular home! See www.carolmurrayrealtor.com/ about this home. View photos of the property at www.tourbuzz.net/public/vtour/gallery/606289 .